ISBN 073903698X. English. 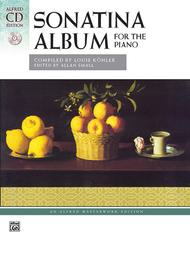 Compiled by Louis KAPhler. Originally compiled and edited by Louis Kohler, this edition contains some of the most popular keyboard sonatinas, rondos and other works (including symphonic transcriptions) of Beethoven, Clementi, Haydn, Kuhlau and Mozart, among others. In clarifying this edition, editor Allan Small has removed impractical fingerings and unnecessary accidentals found in other editions. The comb binding creates a lay-flat book that is perfect for study and performance. The Alfred Masterwork CD Editions conveniently combine each exceptional volume with a professionally recorded CD that is sure to inspire artistic performances. August 17, 2008 Great Book! I haven't had a lot of time to use this book, but I have enjoyed everything I have played in it. It is easy to read. Looking forward to spending more time at the piano soon!